Become an owner in Peisey-Vallandry ski resort. 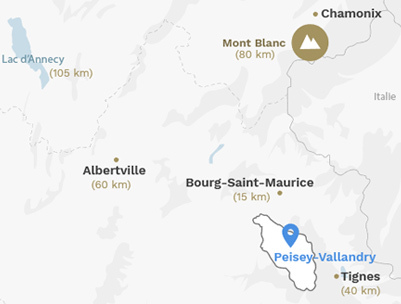 Tucked away at an altitude of 1,600 m, bordered by forests, Peisey-Vallandry offers direct access to Paradiski, one of the world's biggest ski areas with 400 km of slopes. A true haven of peace in the Vanoise National park, Vallandry has managed to keep its authenticity and charm. Guided torchlit tours of the village of Peisey are organised to explore the narrow streets, traditional chalets and houses, its ancient baroque church…the occasion to discover the authentic charm of an alpine village. Near the slopes and the centre of the resort, with a spectacular view over the whole valley. The capital of skiing and mountaineering, Chamonix is an exceptional resort/town. It is one of the most attractive tourist towns. It welcomes visitors from all over the world who come to admire the splendid, unique panoramic views. The resort of Les Carroz d'Arâches is one of the oldest winter sports resorts in France. Situated in the heart of the Grand Massif, it opened its first draglift in 1963. Authentic and convivial, the resort of La Rosière is at an altitude of 1850 metres in the heart of Haute-Tarentaise.